Transition through the menopause in a calm, comfortable way with the help of True Food Super Potency Soyagen. Our most potent soya formula yet, this concentrated supplement contains activated Soya isoflavones from organic, non-GMO sources, which can help contribute to the regulation of hormonal activity. Derived from whole foods, this complex also features naturally occurring beta-glucans, to aid the normal function of the immune system. My hot flushes were out of control, and I can't take HRT due to family history. 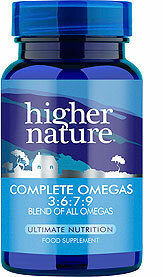 Within a month of beginning to take these, the hot flushes had virtually gone away completely. Recommended by a friend, and I could never thank her enough - I have my life back! Fabulous product. Spread the message. This product is fabulous. my menopause commenced when I was 40 years old. I have used this product for twenty five years. 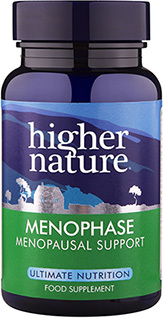 From the first time I used this my symptoms of menopause disappeared. Pure freedom. Thank you Higher Nature. I worked in medicine for nearly 20 years and have been used to prescription only medicines for controlling symptoms in patients ailments. I have been suffering with really bad hot flushes both day and night which have been an experience and a half! Before I turned to the tried and trusted HRT from my GP to control my hot flushes I thought I would try a natural remedy. 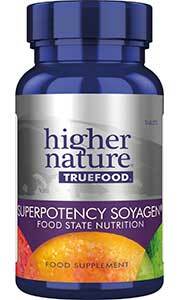 Super potency Soyagen has been remarkable. From the very 1st tablet they have reduced the amount and severity of the flushes. Symptom control without the risk of cancer, can't ask for more than that! A friend recommended this, and I have been taking it for a month. It has definitely reduced the hot sweats at night. Can tell it was working from first day! Amazing product. Could feel the difference in just one day. 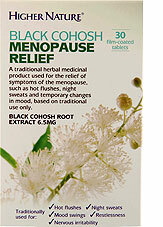 I have sailed through my menopause with this product. I know it makes a difference because if I run out or forget to take them then the hot flushes return !!! Thoroughly recommend this product.